These soft, cuddly dolls are all made very simply by tying round a short thick skein of wool to form head, body, arms and legs. Easy knitting stitches are used to work the outfits. He looks so smart in his outfit of navy blue and white. 1 pair of UK No. 13/2.25mm/US 1 knitting needles a No. 13/2.25mm/US B-1 crochet hook and a tiny piece of wadding. Doll measures about 7¼ inches in height. Work stocking-st at a tension of 8½ sts and 12 rows to 1 inch. Note: This patterns uses UK crochet terms. UK double crochet = US single crochet, UK treble = US double crochet and so on. Note: St-st is 1 row k, 1 row p alternately. G-st is k every row. M-st is k1, p1 alternately along one row, and p1, k1 alternately along return row. Wind the white wool 140 times round a piece of cardboard 7½ inches deep. Tie top loops tog, then divide and tie the strands as in Fig. 1 for body and head. 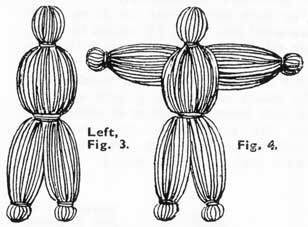 Cut arms short to 2¾ inches long and tie legs and arms as in Fig 2. Stuff body with wadding. The jersey is made of a straight piece of st-st, front and back. They are sewn together on the shoulders and sides, with openings left for neck and arm holes. For front and back, cast on 24 sts with navy wool and work in st-st for 2 ¾ inches. Each sleeve is a straight piece to match, but cast on 20 sts and work only 2¼ inches before you cast off. Sew up jersey as described. For the collar, cast on 20 sts with white wool and work in st-st for 1¼ inches. Next row : K6, cast off 8 sts for neck, then k to end. Work each side separately, decreasing 1 st at inner edge of every 5th row until 1 st remains. For the trousers you need two straight strips of st-st, one for each leg. Cast on 24 sts for each in navy wool and work 3¾ inches. Cast off. 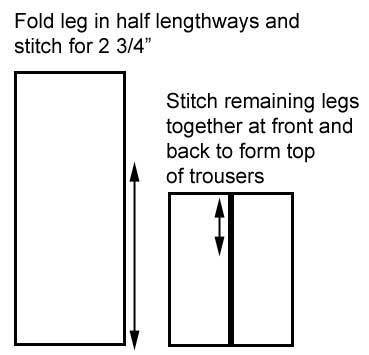 To make the trousers, simply fold each piece of knitting double, the longer way, and sew up for 2¾ inches to form leg; then sew both sections together by remainder of these edges, above leg seams. 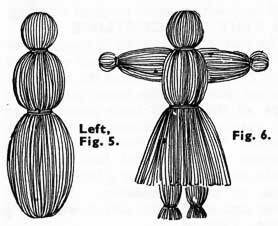 Sew trousers waist to body of doll. 1st round: Work 1 dc into each ch. Rep the last 2 rounds once more. 6th round: As 2nd. Fasten off. For the under crown, make 16 ch with navy wool and join into a ring. Now work 1st and 2nd rounds of top crown. Fasten off. Sew it to top crown and work a row of tr round head edge, for headband. For the feet, work as for top crown, but omit the 6th round. For each hand, cast on 8 sts with white wool and knit in g-st for 1 inch; cast off. Fold each hand section in half and sew up the sides, sloping in the top of seams. Sew hands to edges of sleeves, then sew feet over the holes at base of trouser legs. Work straight stitches in black for the hair, eyebrows and nose, work 2 chain-st loops in red for the mouth, and sew on the under-section of two press-studs for the eyes. Tack collar to jersey and finish front with a knotted chain of white wool. 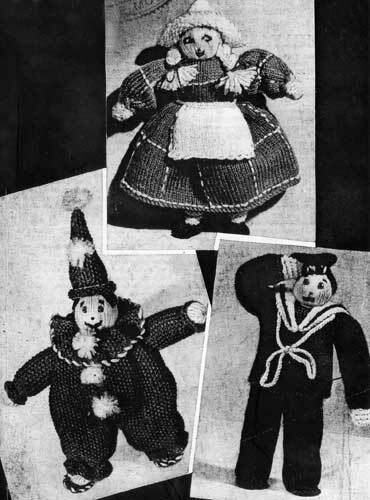 Billy the Clown is so colourful in his gay scarlet suit with merry little pompons of white. Work moss-st at a tension of 10 sts and 14 rows to 1 inch. Wind the pink wool 150 times round a piece of cardboard 7½ inches deep. 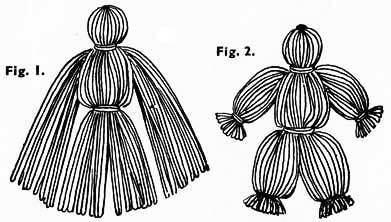 Tie the top loops tog, then tie the strands for head, body and legs as in Fig 3.
thread the arms right across through the body strands, just below neck, as in Fig. 4. Stuff body with a small piece of wadding. For the back, cast on 24 sts in red wool and work 2 inches. Leave these sts and work another piece in the same way; then work all the sts of both pieces onto one needle and continue for 3 inches. Cast off. Work the front to match,then oversew the front and back together by the cast-off edges for ½ inch at outer edges to form shoulders. For each sleeve cast on 20 sts and m-st for 2¼ inches. Cast off. Sew sleeves to side edges, then slip costume on doll and join the side and sleeve seams, also inner leg seams. Gather trouser legs just above base to form a frill, and gather sleeve to match. For the neck frill cast on 74 sts with red wool and work in m-st for 1 inch. Cast off. Gather frill and sew to neck. For the hat, cast on 36 sts with red wool and work in m-st for 36 rows. Cast off. Join edges to form a cylinder, then tuck in the upper part of seam to give a pointed effect and stitch the edges together. 2nd round: Work 2 dc into each dc. 3rd round: Work 1 dc into each dc. Rep the last 2 rounds once more. Roll up base of hat and sew to head, then trim hat and costume with tiny white pompons. Sew one of the shoe circles to base of each leg, arranging it to stick out slightly in front. Embroider whip-st in white wool over the edges of shoes and frill. Gretchen, the little Dutch girl, has a dress in sky blue checked with embroidered white running stitches. Her bonnet and apron are in white, and her pretty plaits are corn yellow. Doll measures 7½ inches in height. The st-st is worked at a tension of 8½ sts and 12 rows to 1 inch. Wind the pink wool 150 times round a piece of cardboard 8½ inches deep. Tie the top loops tog, then tie 1¼ inches down from top end for the head, and tie again 2 inches farther down for the waist (Fig 5). through the body just below neck, as In Fig. 6. For the skirt, cast on 106 sts with blue wool and work in st-st for 3½ inches. Cast off. For each sleeve, cast on 30 sts with blue wool and work 2¼ inches in st-st. Cast off. Trim all the sections with rows of running-sts, working the rows in white wool and in a check effect. Join side seams of bodice ½ inch at waist end and leave remainder of side edges open for armholes. Join shoulders for ¼ inch. Gather skirt and sew to bodice, and sew sleeves into armholes. 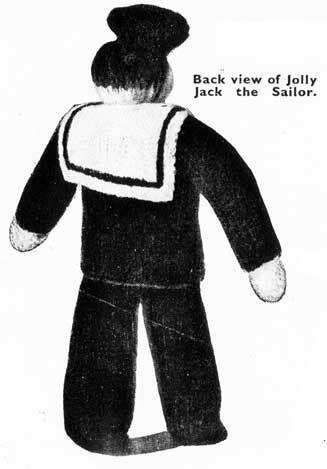 Slip frock on doll and join the remainder of shoulder seams. For the apron, cast on 22 sts in white wool and work in st-st for 1¾ inches, then on the next row knit 2 together all along. Cast off. Now, using the crochet hook, work a row of dc along top edges of apron, and finish each end with a chain about 6 inches long for ties. Finish apron with an edging as follows: Work a dc in side edge near waist, * 3 ch, miss 1 inch of edge and work 1 dc in edge; rep from * all round side and lower edges. 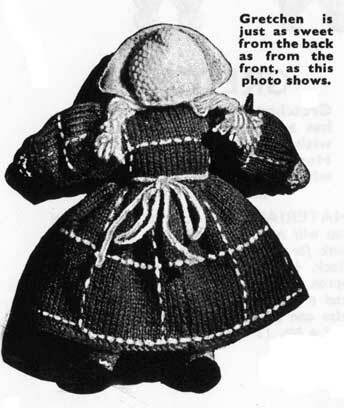 To make the bonnet, cast on 30 sts in white wool and work 1¾ inches in m-st. Cast off. Fold the strip in half across the shorter way and sew one side for the back seam. Turn back the front half an inch and work a row of dc round the base of bonnet. For each hand, cast on 8 sts in white wool and work in g-st for 1 inch. Cast off. For each sock, cast on 12 sts in white wool and work in g-st for 1 inch. Cast off. Work the shoes in the same way as the socks, but use brown wool. Work a few straight sts across the front of the head in yellow wool for the hair, then make two plaits and sew on either side. Sew bonnet to head. Fold each hand section in half and sew up the sides, sloping in the top of seams. Gather lower edges of sleeves and sew to hands. Join each sock to form a circle, slip on to leg and secure in position at top with one or two rows of running­ sts worked in blue wool. Fold each shoe strip double and sew up the two ends, then sew top edge together for ½ inch to form toe. Slip base of leg inside open top edges of shoe and catch up the tip of toe onto “instep” to give a clog effect. Work a small inverted V in brown for each eyebrow and straight lines for the eyes and nose, and work a chain-st in red for the mouth. The original version of this pattern is in the public domain, however this digital version with modernised language and clarifications, plus the additional graphics are copyright Sarah Bradberry, May 21st 2012. All rights reserved.